Grade point averages (GPAs) are derived from quality points (a/k/a grade point average values) that are assigned to letter grades. A student’s GPA during high school is equal to the sum of the total quality points earned divided by the number of courses attempted. The minimum grade point average required to earn an Aspiring Heights Academy diploma is 2.0 on a 4.0 scale. While Florida public schools follow the standard high school grading system outlined in Florida Statute 1003.437, Florida private schools and schools in other states may or may not. Also, Florida schools and schools in other states may assign different quality point values for Honors, Advanced Placement (AP), International Baccalaureate (IB), Advanced International Certificate of Education (AICE), and Dual Enrollment (DE) courses. 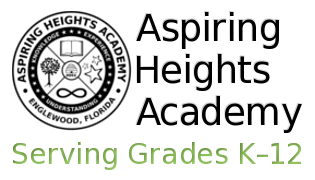 Because of this, students enrolling at Aspiring Heights Academy will likely have transcripts from different schools using varying grading systems. GPAs are calculated yearly and cumulatively. GPA scores are rounded to the second digit after the decimal place (e.g., 3.975 rounds to 3.98). Yearly GPAs are calculated by adding the quality points earned for the school year and then dividing the sum by the total number of courses attempted for the school year. The cumulative GPA is calculated by dividing all quality points earned during high school by the total number of all courses attempted during high school. Both yearly and cumulative and weighted and unweighted GPAs appear on Aspiring Heights Academy transcripts. Required Courses: Grade forgiveness for required courses will be limited to replacing a grade of “D” or “F” with a grade of “C” or higher earned subsequently in the same or comparable course. Elective Courses: Grade forgiveness for elective courses will be limited to replacing a grade of “D” or “F” with a grade of “C” or higher earned subsequently in another course. Middle School Exception: Grade forgiveness for a student in the middle grades who takes a high school course for high school credit and earns a grade of “C,” “D,” or “F” will be limited to replacing a grade of “C” or higher earned subsequently in the same or comparable course. In all cases of grade forgiveness, all grades will remain on the student's transcript, but only the new grade will be used in the calculation of the student’s grade point average. Any course grade not replaced according to these forgiveness policies will be included in the calculation of the student's cumulative grade point average. The Florida Bright Futures Scholarship Program has a different weighting system and evaluation for Bright Futures includes an unrounded weighted high school GPA (calculated to two decimal places) in the 16 college-preparatory credits. If necessary, students may use two additional credits from courses in the above academic areas, or from AP, IB, or AICE fine arts courses to raise their GPA. Colleges calculate GPAs based on their own criteria. Additionally, the acceptance of "forgiven" courses in the computation of the student's GPA is subject to the policy of the receiving educational institution.